Please note: This exhibition is located on the first floor and we regret that it does NOT have step free access. 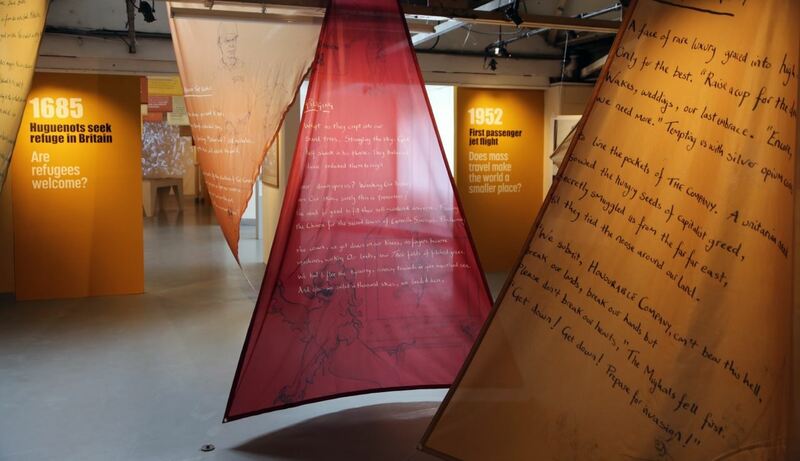 Join YCL Art Circle for a private, out-of-hours tour of the Migration Museum's exhibition No Turning Back: Seven Migration Moments that Changed Britain with Aditi Anand (ES '07), Head of Creative Content, followed by drinks in the space. The EU referendum result and ongoing Brexit negotiations have sparked debate about Britain’s relationship with the world and uncertainty about migration to and from the country. But Brexit is far from the first pivotal moment in Britain’s migration history. This exhibition explores seven such turning points that had profound effects on the nation and its people – and which continue to resonate today. Each moment is explored through a combination of personal stories, commentary, photography and art from established and emerging British and international artists and contributors. The Migration Museum Project is shining a light on the many ways that the movement of people to and from Britain across the ages has shaped who we are – as individuals, as communities, and as a nation. It is a far-reaching nationwide education programme and a knowledge-sharing network of museums and galleries across the UK. Aditi Anand is the Head of Creative Content at the Migration Museum Project, where she curates exhibitions and manages creative partnerships. Previously, she wrote and produced a film and radio series around social issues in India that aired on STAR (India’s largest TV network) and All India Radio and was communications lead for India’s largest media for social change initiative. She has also worked as an educator at the Museum of the Moving Image and as a freelance content developer for an exhibition design firm, Local Projects, in New York.